Is it ethical to poach other letting agent's landlords? If you were to deliberately target one competitor's landlords because they are clients of that competitor … is that ethical? Or is it a vital part of a free market that competitors are allowed to compete against each other in the market place. This would include but is not restricted to obtaining their clients. If this freedom is not upheld then poor businesses will succeed and good businesses will be held back. 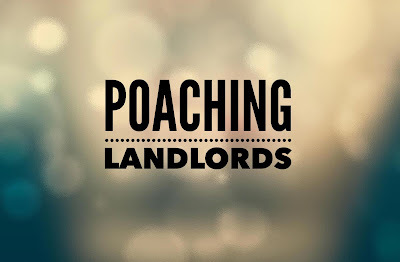 Although on Wikipedia poaching starts 'Poaching is the illegal taking of....' so should be ashamed of poaching landlords? .. but everything is fair in love, war and business? Surely, if you are doing a good enough job as an agent, even if a competitor came knocking on your landlords door – they wouldn’t swap, would they? .. Or would they? In today's increasingly competitive lettings environment, understanding and beating competitor’s agents is more challenging than ever before. The complexity of the current lettings market demands flexible and quickly executed strategies in order to gain landlords loyalty through superior customer relationships. These strategies must be carried out at the expense of defined competition, directly challenged one landlord at a time for landlord share and, in collectively, for market share. I carried out an exercise for an agent in Northern England on eight of the largest apartment blocks in the City Centre. A total of 1,800 apartments and and of the 1,250 landlords (the rest being s.106 housing association tenants or owner occupiers) , less than 200 even lived in the County, let alone the City itself .. the rest were from across the UK and even around the world. .. so content marketing wouldn’t work in these situations, as you couldn’t get your message to the landlord if they lived 200 miles away. I can find the whole stock list of any letting agent in England and Wales. When I say whole, I mean the whole stock list, not what is on the market today. Letting Agent Competitor Targeting provides the tools necessary to wage and win the business war of being a letting agent. This isn’t landlord database list to be sold. This isn’t a list of HMO landlords scrapped from every council. This isn’t a list of landlords whom ticked a box on a website. Each list is individually hand built and very labour intensive. For example, it takes 50 to 70 hours to build the list of a letting agent with lettings book of 200 properties. .. but the data on its own wont get you the landlords. You then need the second part of the campaign to kick in of attracting the landlords to you. They aren’t going to swap agents because you wrote them a letter or called them. My bespoke marketing plan, using Letting Agent Competitor Targeting will design an individual initiative to ethically, legally, and responsibly get you more landlords. Now more than ever, survival of the fittest applies to the letting agent landscape. Those fleeter of foot, sharper of mind, better armed and better supported earn the right to live and fight another day and to evolve to a higher and yet more profitable state. Letting Agent Competitor Targeting provides a roadmap for winning strategically, tactically and in real-time to increase market share and customer share. .. and it isn’t cheap either ..
You are looking at a cost of around £15 to £20 per landlord but that does include a number of special things .. how much s landlord worth you agency? In London, the average landlord is worth £1800 a year in years, and another £1800 in fees next year, another £1800 the year after … need I go on?